Calendars say it’s Spring but weather has many of us still stuck inside . . . and our brains are fried . . . with boredom. What I do for this malady, is rearrange, a lot! It refreshes the spaces in your home and your mind. Best part is, it doesn’t cost anything! Just be careful with heavy stuff. You don’t want any ER trips for a back out of whack. 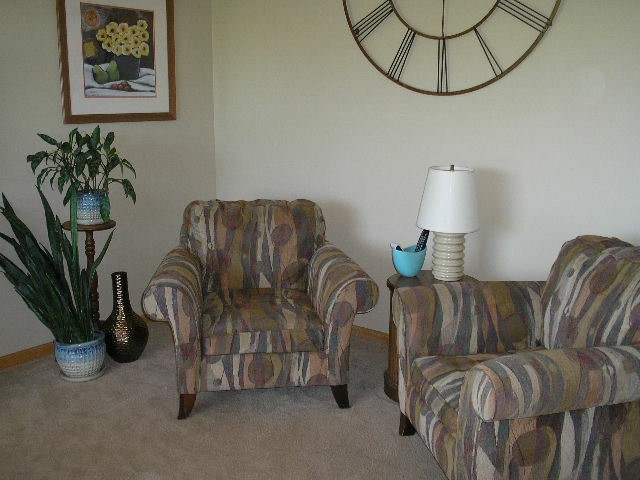 Today, I have hints on how to improve your furniture groupings. Let’s pretend you’re looking at one of your main living areas, and you think “it’s not so bad, I like my stuff in here.” But there’s just a little something off and you wish you could fix it. Consider the area below, a conversation area in an average sized living room. Nice things here so what’s wrong? Maybe because most of our first places are small, we want to push things out and use every inch of space when we graduate to bigger rooms. It’s almost a natural instinct, but spreading out dooms arrangements. The group above is dead because of the spread. Move pieces closer together, making it a more inviting arrangement. 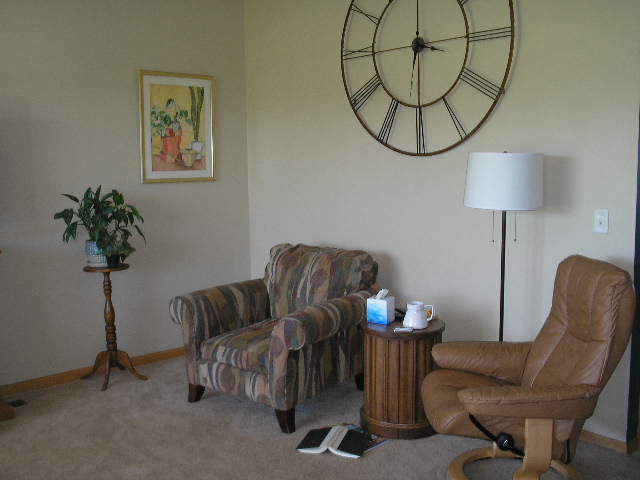 Below, notice how we pulled the chairs closer together, angled them and centered things, table and all, under the wall clock. This is a conversation area, but now you won’t have to yell across the room to converse! Make your pieces communicate, so that your guests can too!. YES . . . me, the “no clutter” freak . . . I just told you to add more stuff here. Key word here is “sometimes”. The solitary plant gets some company with another plant and vase. And all are moved closer to the seating. By using three items instead of the one lonely plant and positioning them beneath the picture, you create more interest and also better flow for the eye, connecting everything in your arrangement. The blue keeps going with the second planter. We also added the matching ottoman for the easy chair. I mean, what would you do with it otherwise? Okay, I did take away somethings – the picture was replaced with a larger, more color appropiate one. And a table lamp is substituted for the floor lamp. Remember to always provide good lighting for every seating arrangement. Above, simply using a different lamp, and swapping the coordinating lounger for the matching chair, quickly gives you another look. 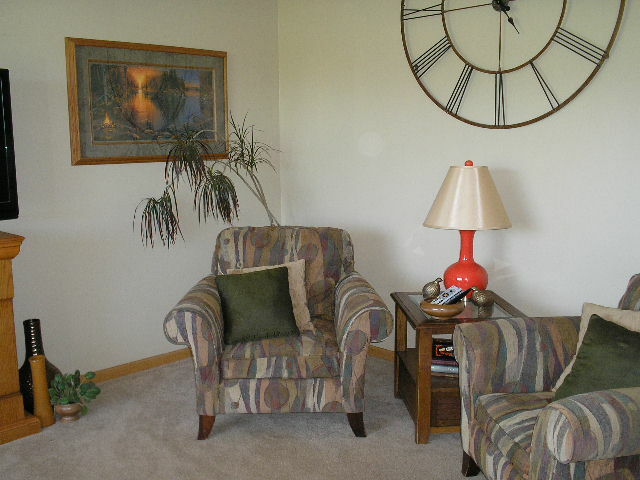 Below, we added some toss pillows, changed back to the larger lamp and went to a bigger table. Now this group will work for reading and/or TV viewing as well as conversation. We’re beginning to experiment with the floor arrangment and try a third picture. No Big Deal if something doesn’t work. Here the plant behind the chair just doesn’t work, AND should be removed 2. The new “two” pillow colors and the added oranges in the floor group and the table lamp, DO work and now you have yet another change. TIP 1: In furniture arrangement consider communication and conversation. These might seem to be the same things but here, you want your furnishings to communicate, as well as your guests. Pulling pieces together avoids that isolated, disconnected look. Conversation is a given when more than one seating piece is involved, because you are inviting two guests to sit, and they’ll want to talk, so don’t make them shout by spreading things out. 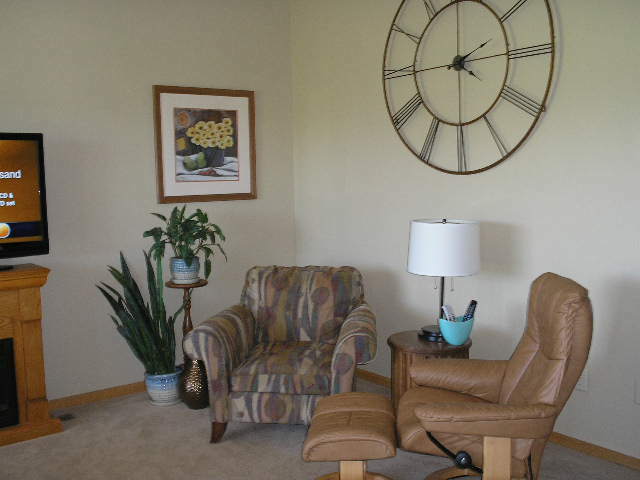 TIP 2: Comfort is always important, whether in a single chair grouping or a conversation area. Remember to include proper lighting and available table surface in any seating arrangement, for comfortable use. And angle chairs towards each other. Avoid pushing everything flat up against the wall. TIP 3: Use what you have. Everything doesn’t have to match to work together in a grouping. Use what you have and what you love. Relate pieces through color, accessories and good arrangement. Sometimes the differences in pieces are what make the grouping interesting. Above all, have fun. Don’t stress, just start. Hey, I love hearing from you. What do you think? Leave a reply below . . . and let me know! This original article “Spring Arrived but We’re Still Inside” appeared first on Artzzle.com. No included content or photography can be used elsewhere without specific permission and accreditation. It isn’t a very mobile Monday as my back remains out of whack, but I don’t like to miss a post. Recently I’ve gotten some requests to feature our place in a home tour, so thought this might be a good time to put some of those pictures out there. Today the light was decent for getting some living room shots so that’s what I’ll share this time. 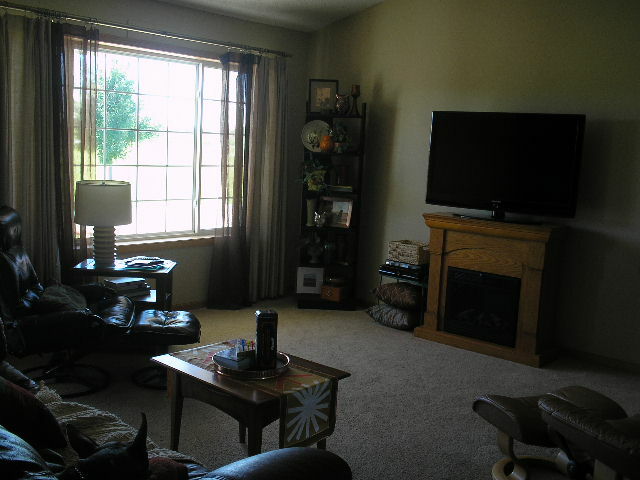 This angle is looking into our living room from the kitchen. Our house is a basic one level. In Minnesota it’s called a rambler, but is also sometimes referred to as a ranch style. The main living areas of the house flow into each other, in a very open floor plan. This includes a living room, dining room and kitchen, and on into a family room. You’ve seen this shelf piece before. We purchased it several years ago at Crate and Barrel. Such a versatile unit, it can be on a flat wall, up against a corner wall or straddled across a corner as it is here. You can also pair it back to back with an identical shelf for a nice look. We’ve even used ours horizontally on the floor as well. The two glass owls in this display are from KOHL’s (a birthday gift). 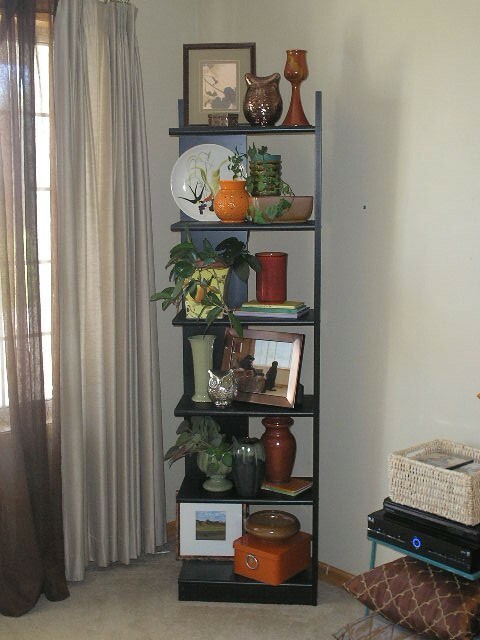 Except for the photography and plants here, everything else is from thrift stores or garage sales, and was purchased for next to nothing (including the Hull, Frankoma and noemi pottery pieces). The blue metallic piece is simply a small table from an outdoor patio set. It holds our electronics and a little basket for movie storage. The open leg area makes a perfect spot for extra toss pillows too. This is a small credenza piece, circa mid 1960’s. 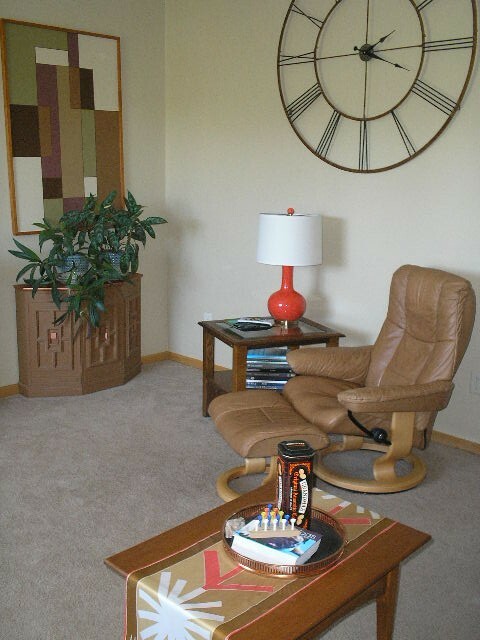 It was one in a set of three tables in my mom’s home; a brown, wood-look formica style popular at that time. I have redone this table three times. This treatment is my favorite as I used metallic copper paint to resurface the top and hardware, and added a light texture treatment to the paint in the body of the piece. Formica can be easily and economically redone. I love this credenza because its’unique shape and size can be used in so many places, and it was a special piece to my mom. The art piece pictured here is something I painted several years ago. I just plotted out a geometric layout that I liked. It is painted on masonite, simply using latex wall paint. Then the blocks were outlined with a copper paint pen. Over time, as I change colors in my houses, these colors change as well. The piece is designed to hang either horizontally or vertically as featured here. 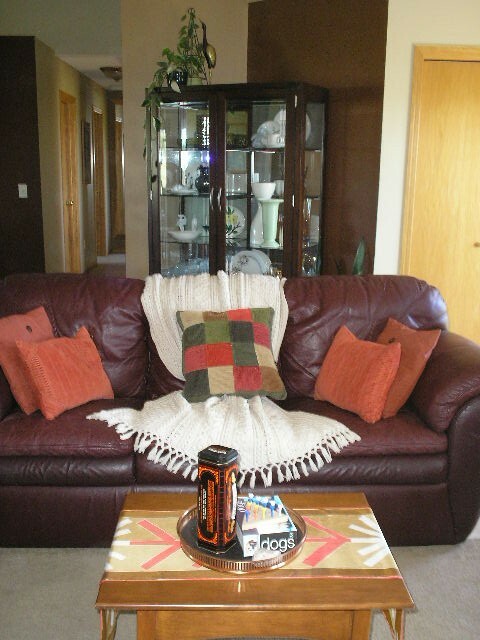 The orange lamp, petite coffee table and its’ accessories are all thrift store finds. 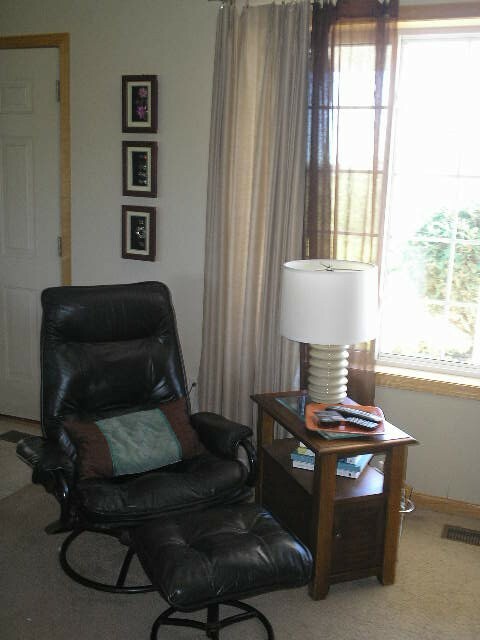 $7.00 for the lamp (new with tags), $10.00 for the table and $.75 for the scarf (which is an original Vera Wang textile). The copper tray was under a dollar. Our living room is wonderfully workable for several layouts. 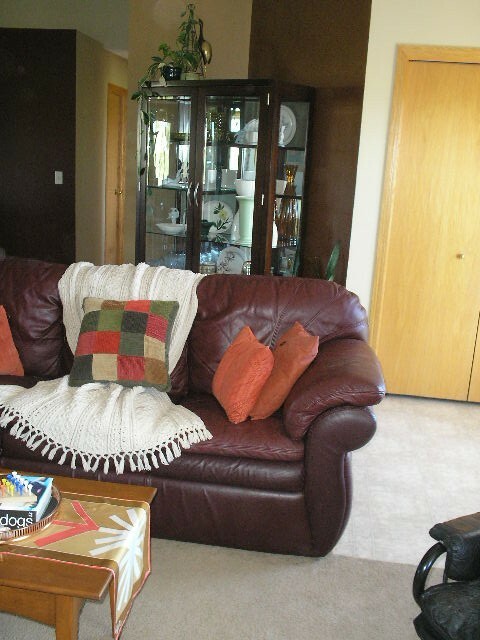 The couch out into the room as it is here, is one of our favorite arrangements. 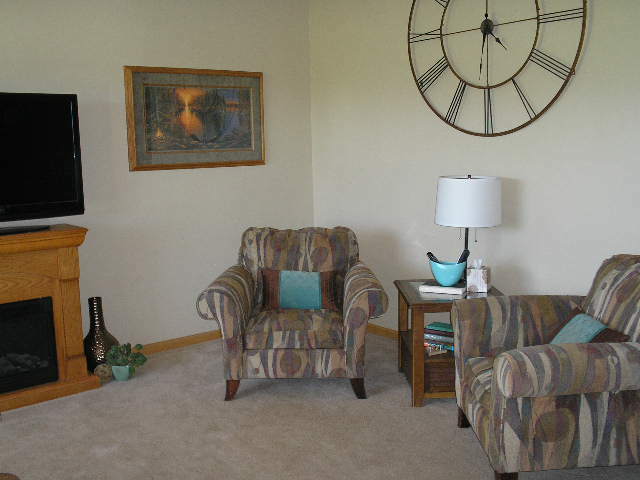 We also like our hutch across the angled walls as you see here. The larger, square toss pillows are in indoor-outdoor fabric, and were purchased new at Wal-Mart for $4.64 each. I liked the design and durability, especially with our pets. The orange and patchwork corduroy pillows are part of a comforter set that I found at a garage sale recently. The material washed up quite nicely and is very durable. 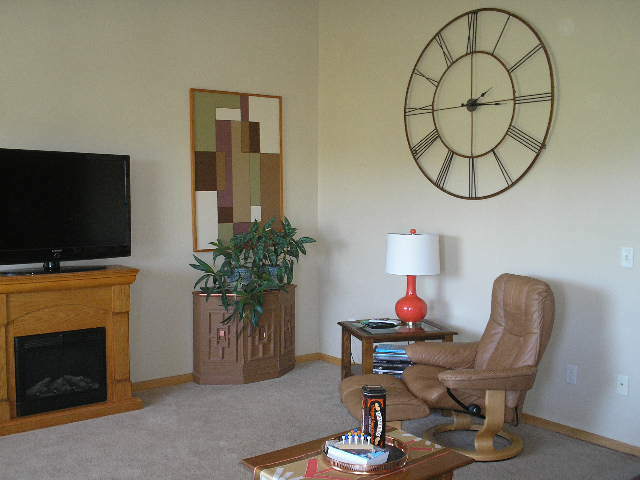 And by using some of the items in different rooms, it helps unite the spaces. Finally pictured is Hubs’ favorite chair. Let it be known that a man is not easily separated from his electronics OR his favorite chair. I can hear someone saying “that looks like one of those vinyl sets you used to buy at big box stores”. Yes it does look like those, but it has a special story. In the late 1990’s I worked for Dayton’s, a wonderful upscale store in Minneapolis. At that time employees got fantastic discounts, and even more so twice a year during their “employee appreciation days”. Hubs fell in love with this chair, which was an exclusive design, in leather, imported from Italy. We had never seen anything like it. Even with my discounts, it was pretty spendy for us, but I wanted him to have the chair. Fortunately for some, but unfortunately for us, within a year’s time, there were vinyl knock-offs of this design in every big box store around, going for about $99. The only proof we have of its’ authenticity is that it is nearly 20 years old, and still looks and feels like new. The three framed items were made with dollar store picture frames. I removed what was originally displayed, lined the back with black velvet, and then arranged several pieces of jewelry that had belonged to my mom, my aunt and my grandmother. The lamp is another thrift store purchase @ $5.00. TIPS: Always inspect wiring on these lamps; you don’t want dried out, or taped cords, or cracked cords or switches. Take a light bulb with you on your thrift trips, to test the lamp before you buy. REMEMBER, shades are easy to buy and or replace now days, so don’t pass up a great lamp base because of an ugly shade! Thanks for stopping by today. Let your friends know we’re here. The more the merrier.